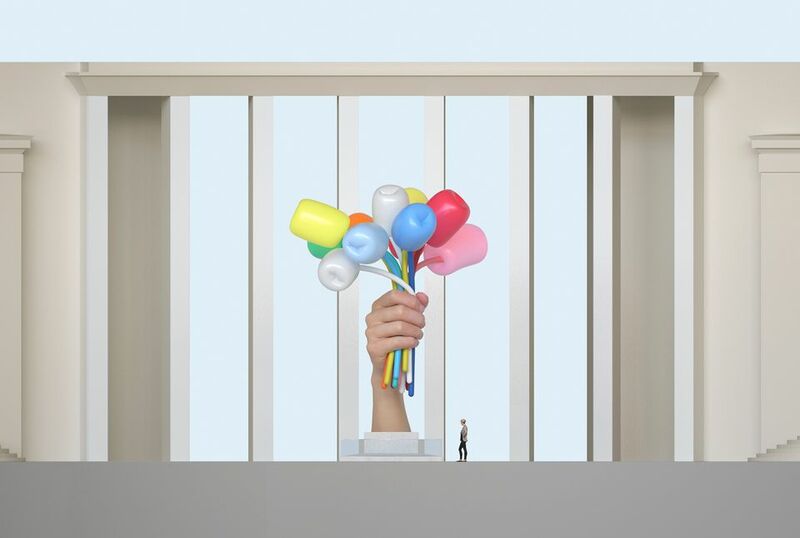 Jeff Koons' sculpture Bouquet of Tulips, made to pay homage to the victims of the November 2015 terrorist attacks in Paris, is still awaiting authorisation to be installed in front of two museums in the French capital. The 11m-high sculpture of a hand holding a bunch of 11 tulips (the missing twelfth flower represents those who lost their lives), was conceived by the artist at the request of Jane Hartley, the former US ambassador, who wanted to extend support to France. “Bouquet of Tulips was created as a symbol of remembrance, optimism, and healing in moving forward from the horrific events that occurred in Paris one year ago,” Koons wrote in a press statement in 2016. Noirmontartproductions, founded by Jérôme and Emmanuelle de Noirmont who represent Koons in Paris, suggested that the symbolic place for the sculpture would be in front of the Palais de Tokyo and the Musée d'Art Moderne de la Ville de Paris. Produced with funds from French and US donors, the brightly coloured sculpture has neared completion. But its future home is still undecided and is proving controversial. According to the French newspaper Le Figaro, the mayor of Paris Anne Hidalgo suggested other sites—such as the park of Passy or La Villette—but Koons was adamant about the proposal. “No other place has the same symbolism and it's a magnificent present from the US to France,” Emmanuelle de Noirmont tells The Art Newspaper, adding that Koons would donate all revenue from the ensuing postcards of the sculpture to the families of the 130 victims from the terrorist attacks for 25 years. The decision lies in the hands of the French culture ministry, which manages the Palais de Tokyo. The ministry is still mulling Koons' present after receiving complaints from French artists who do not wish to see the flamboyant sculpture in front of the prestigious art centre and musem, according to Le Figaro. ​Other critics think that the gift is ostentatious and self-interested.​ The ministry has not yet replied to The Art Newspaper's questions on the issue.